Two-factor authentication adds an extra layer of protection to your account. Whenever you or other users sign in to any Flipcause application, you'll need to enter both your password and also a verification code. This verification code will be sent to your mobile device via text message or an authenticator app. You can enable two-factor authentication for your own login and also for other admins on your account (depending on your account permissions). 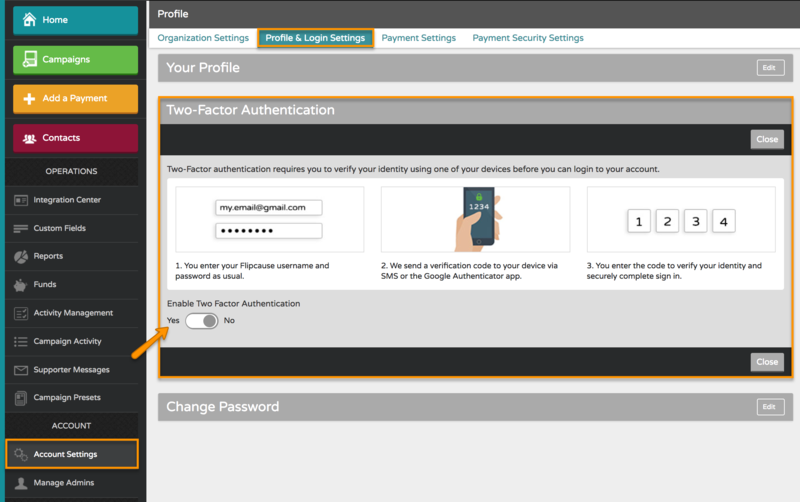 From the Account Settings section of the dashboard, you can turn on two-factor authentication for your own Admin account. From the Account section on the Dashboard Main Menu, go to Account Settings > Profile & Login Settings. Click the Edit button on the right of the Two-Factor Authentication section. Toggle the Enable Two Factor Authentication to "Yes." Click Continue on the popup to begin setup. Note: If you are unable to provide a verification code (via your mobile device or a backup device) you will lose access to your account, and it may take up to 3 business days to recover access. Select how you would like to receive your verification code: via SMS Text Message or through the Google Authenticator app, then click Continue. Enter your mobile phone number where you would like to receive verification codes and click Continue. You will be sent a verification code via SMS text. Enter your code and click Continue. Enter a backup phone number in case you loseaccess to your primary mobile device during future logins and click Continue. You can also choose to Skip this Step. Note: you can edit these phone numbers later from Account Settings > Profile & Login Settings under Two-Factor Authentication. You'll receive a notification that the setup was successful. From now on, anytime you login to your Flipcause account with your username and password, you'll also need to enter the verification code sent to your device. 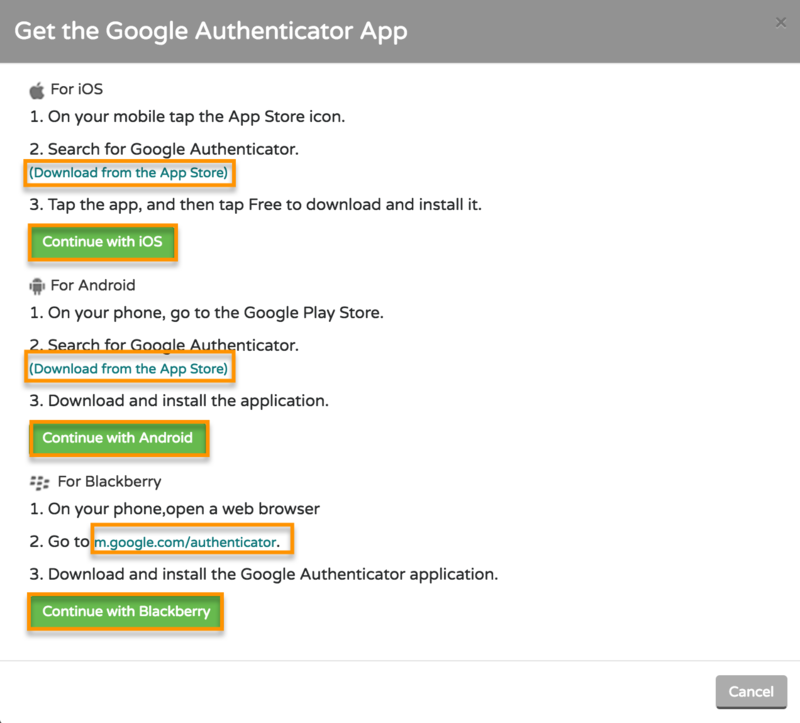 Use the links to download the Google Authenticator app for iOS, Android, or Blackberry depending on your device, then click Continue with iOS, Android, or Blackberry. b) by selecting "Manual Entry" and typing both your email and the string of characters provided into the app. This will generate a code in the Flipcause section of the Authenticator app. Enter this verification code and click Continue. You'll receive a notification that the setup was successful. From now on, anytime you login to your Flipcause account with your username and password, you'll also need to enter the verification code sent to the Google Authenticator app. 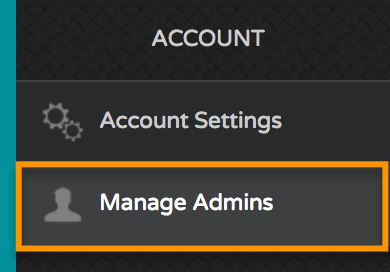 From the Account section on the Dashboard Main Menu, go to Manage Admins > Security & Notification. Select the Authenticator type from the dropdown menu. 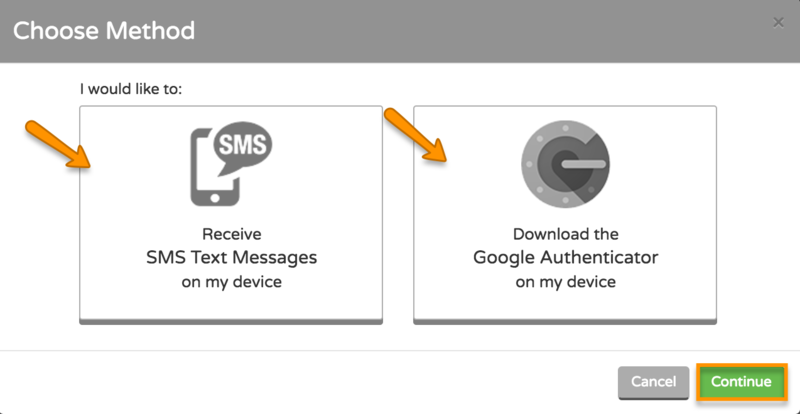 Note: Selecting Any authenticator will let your admins choose to setup either Text Message or Google Authenticator two-factor authentication for their accounts. Choose to enforce two-factor authentication immediately or set a date in the future. 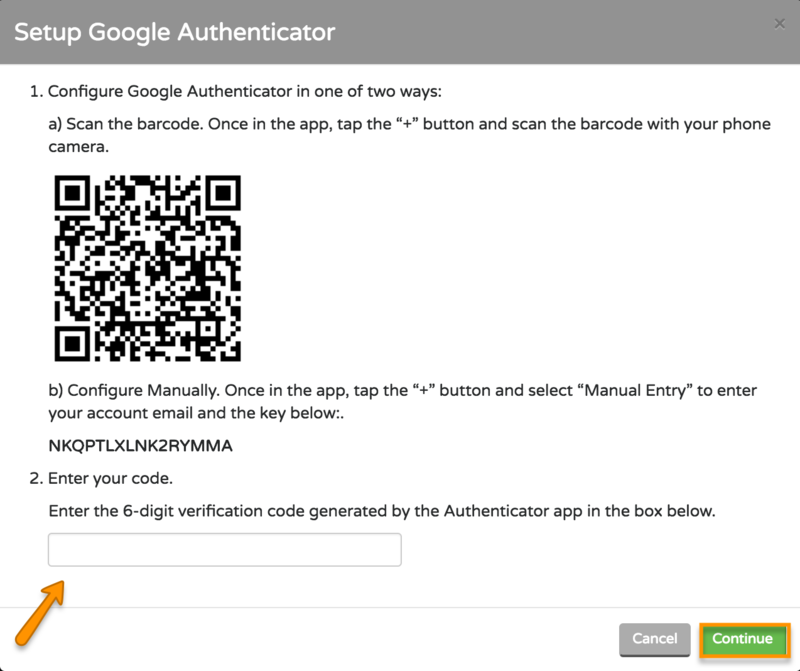 All admins will be prompted at login to setup two-factor authentication for their account. Note: If you choose to setup immediately, all users will be logged out and need to complete setup before accessing the account again. If you select a date in the future, you can communicate the change to your team in advance and let them know to expect the prompt. You'll receive a notification that the setup was successful.